In 2015, an estimated 12% - 23% of the road deaths in the Netherlands were due to drinking and driving, 75 to 140 fatalities. In 2017, 1.4% of the drivers were under the influence of alcohol during weekend nights. This percentage is much higher among cyclists: measurements in 2013 in the evening and at night (17:00-8:00 hours) in the entertainment areas of the cities The Hague and Groningen showed that on average 42% of the tested cyclists had used more alcohol than is legally allowed. About two-thirds of all severe alcohol-related crashes are caused by the relatively small group of serious alcohol offenders. Drivers under the influence of alcohol engage in more impulsive and more adventurous driving behaviour. Furthermore, they assess traffic situations less well, perceive dangers less timely, are less capable of reacting in time, show worse vehicle control and they are less vigilant. The risk of crash is about 1.4 times higher for a driver with a blood alcohol content (BAC) of 0.5‰ than for a sober driver. At a BAC of 1.0‰ the risk is nearly 4 times higher, more than 20 times higher at 1.5‰. Also for cyclists the risk of crashes gets higher with increasing BAC. Deterioration in driving behaviour is more noticeable in younger drivers. The BOB designated driver campaign seems to have contributed to a reduction in alcohol consumption, but the effects of this campaign cannot be separated from the intensified police enforcement of driving under the influence. Educational measures to prevent recurrence have no proven effect. Heavier punishments, suspension or revocation of the driving licence seem to have hardly any effect on the serious alcohol offenders. For this group new preventive measures need to be developed, focusing on a broader approach towards the problem underlying their alcohol offences. How frequent is driving under the influence of alcohol in the Netherlands? According to the latest measurements (in 2017) of alcohol consumption by drivers in weekend nights, 1.4% were under the influence of alcohol . They had a blood alcohol content (BAC) of 0.5‰ or higher; see Figure 1. The alcohol use during weekend nights decreased during the period 2002-2017: it went down from 4.1% in 2002 to 1.4% in 2017. 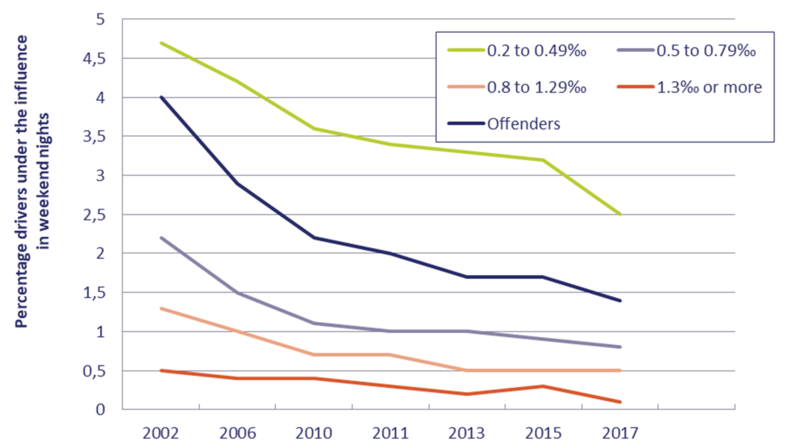 The proportion of serious offenders (BAC > 1.3‰) continued to decrease from 0.3% in 2015 to 0.1% in 2017. Figure 1. Development drivers under the influence in weekend nights 2002-2015 (Source: I&O Research ). The results of the measurements in weekend nights seem to indicate a favourable trend in driving under the influence. It must be noted that up-to-date information in social media/apps increasingly enables drivers to dodge alcohol checks . It is therefore possible that the data gives a somewhat more flattering picture of the situation and that driving under the influence is partly shifting outside the scope of the measurement checks that are specially scheduled for monitoring. Night measurements in 2013 showed that on average 42% of the tested cyclists had consumed more than the legal amount of alcohol (BAC > 0.5‰) . These alcohol measurements were carried out among cyclists in the entertainment area of the cities The Hague and Groningen on Thursday and Saturday nights and evenings (17:00-08:00 hours). The percentage of cyclists under the influence increased as the evening/night progressed: at the beginning of the evening none of the cyclists had a BAC above the legal limit, after 1.00 am 68% of the cyclists had a BAC higher than 0.5‰ and after 5.00 am in the morning this was the case for more than 80% of the tested cyclists. The number of young cyclists (15-29 years) who are hospitalized in weekend nights after a cycling crash not involving a motor vehicle, has been increasing for several decades; in 2014 alcohol played a role in half of these crashes . The long-term development of injured cyclists indicates a trend towards more alcohol consumption. What are the legal alcohol limits in the Netherlands? The general legal BAC in the Netherlands is 0.5‰ and 0.2‰ for novice drivers and (light-)moped riders. For pedestrians there is not a legal alcohol limit. However, the police can report a pedestrian for public intoxication. In such a case, the police will not take a breathalyser test or a blood test, but assess the physical characteristics of drunkenness and the behaviour of the pedestrian. Table 1 shows the legal limits in the Netherlands for different types of road users. Table 2 presents the legal limits in Europe. Table 1. Legal alcohol limits for different road user categories in the Netherlands. Table 2. Legal European alcohol limits in 2017 . What is the effect of alcohol on driving behaviour? Drivers are more impulsive and adventurous when they are under the influence of alcohol. Furthermore, they assess traffic situations less well, perceive dangers less timely, are less capable of reacting in time, show worse vehicle control and they are less vigilant. This deterioration in driving behaviour is more strongly noticeable among the young/inexperienced drivers. Reaction speed: the speed with which one perceives objects, processes the information and reacts, already begins to reduce starting at a blood alcohol content (BAC) of 0.3‰. It then takes longer to recognize a dangerous situation and to react to a red light and to respond to a braking vehicle in front . Vehicle control: under normal conditions, steering skills begin to deteriorate from 0.5‰, but in particularly difficult conditions (e.g. when crosswinds deflect the vehicle) problems are experienced from 0.2‰ . Focus: drivers become less focused from a BAC of 0.3‰ . When blinking the eyes, the times when the driver closes his eyes are longer and the reaction to a simple stimulus is slower . Dupont, Martensen & Silverans  summarize the effects of alcohol on driving skills as follows (p. 7): "automated processes begin to deteriorate from a BAC of 0,5‰; the processes that require any conscious attention of the driver, are already affected from 0.2‰”. In a recent meta-analysis of driving simulator studies into the effect of alcohol use on driving behaviour Irwin et al. found that drinking alcohol (BAC levels ranging from 0.23 to 1.0‰‰) caused more swerving (variation in 'lane position') and more variation in speed. How many casualties in the Netherlands are due to driving under the influence of alcohol? In 2015, an estimated 12 to 23% of road deaths in the Netherlands were related to alcohol. This amounts to 75 to 140 road deaths . Reliable estimates on the proportion of serious road injuries due to alcohol in traffic are not known. The estimate of the proportion of road deaths is based on the proportion of drivers with a blood alcohol content (BAC) above the limit on weekend nights in 2015  and on the basis of data of the risk per BAC-category (see Houwing et al. for the estimation methodology ). The estimate does not distinguish different modes of transport (e.g. cyclists and drivers). The actual numbers of road deaths and injured in alcohol-related crashes are not known. The information in the police crash registration and in the hospital registration is incomplete as alcohol tests are not always carried out. In addition, road deaths are very rarely tested for alcohol, as this is not considered useful from the perspective of criminal law. In April 2018, the Dutch Minister for Legal Protection Sander Dekker announced to investigate whether a blood test can be done on road users who caused a serious crash in which they died themselves. What are the risks of driving under the influence of alcohol? The risk of a crash increases as a driver drinks more alcohol. At a blood alcohol content (BAC) of 0.5‰ the risk of a crash is approximately 1.4 times higher than when no alcohol has been used. At a BAC of 1.0‰ the risk is just over 4 times higher, and at a BAC of 1.5‰ the risk of a crash is more than 20 times higher as that for a sober driver . Figure 2. 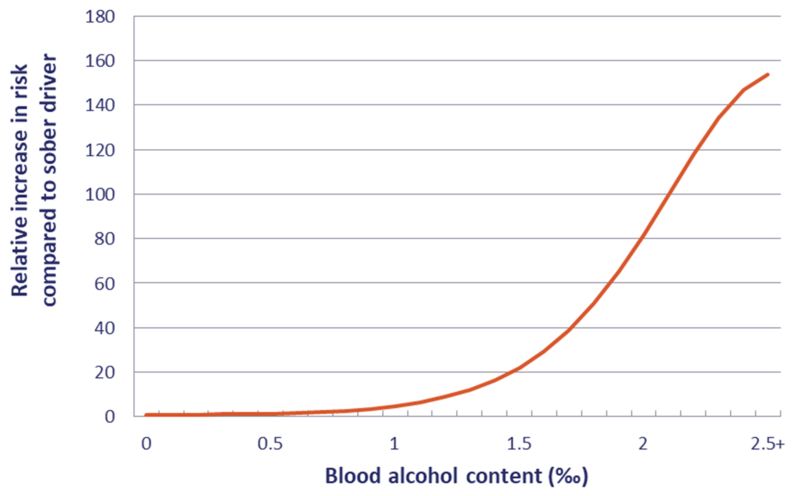 Relative increase in risk at increasing blood alcohol content (Blomberg et al., 2005; Table 33 ). The crash risk of cyclists increases as their BAC rises. According to a Finnish study, the risk to get injured in a cycling crash is 8, 13 or almost 60 times higher respectively for the ascending BAC-categories 1.05-1.54‰, 1.55-2.04‰ and 2.05‰ or higher . More recent studies also found that alcohol has a risk-increasing effect for cyclists, but these studies provide no information on different risks at BACs. In Canada, Asbridge et al. found that the risk (odds) of a bicycle crash was 4 times higher after alcohol consumption. The risk increase was established by different types of measurements of alcohol use: both the questionnaire measurements and the measurements via blood values gave the same risk increase. In Spain Martínez-Ruiz et al. investigated the relationship between the use of alcohol or drugs and the risk of cyclists themselves causing a crash. This study found that after using alcohol or drugs cyclists had a 4.5 times higher risk of they themselves causing a crash with another vehicle and a 12 times higher risk of a single bicycle crash. The combination of drug and alcohol use results in a risk increase comparable to driving under the influence with a BAC higher than 1.2 ‰, which can be labelled an extremely increased risk. The risk of being seriously or fatally injured in a crash is 20 to 200 times higher than under normal driving conditions. The range is wide because the different risk estimates vary, depending on the European country in which the research was carried out, the type of drugs used, and the risk-outcome used (the risk of death or the risk of serious injury). Late 2011, a large-scale European study into driving under the influence of alcohol, drugs and medicines in the period 2007-2009 was concluded; the study was called DRUID: Driving Under the Influence of Drugs, Alcohol and Medicines ). Figure 3 shows the results of this research for the increase of crash risks for the separate use of alcohol and the combined use of alcohol and drugs. Figure 3. Relative risk of severe or fatal injury due to the use of psychoactive substances in traffic . Which risk groups are distinguished in the Netherlands? Although in 2009 men aged 18 to 24 years old formed only 4% of the total number of driving licence owners, according to the European study DRUID (Driving Under the Influence of Drugs, Alcohol and Medicines) they formed 29% of the seriously injured drivers who had used alcohol . Young women were found not to be over-represented among the seriously injured drivers who had used alcohol. Although young drivers use less alcohol in traffic than older drivers , they are over-represented in the group of casualties and drivers involved in alcohol-related crashes .The reason is two-fold: due to their inexperience young drivers have a higher crash risk in any case, and alcohol has a greater effect on the driving of young drivers than on that of older drivers   . It is estimated that between 90,000 and 125,000 drivers in the Netherlands can be characterized as serious alcohol offenders: offenders who have been apprehended with a BAC > 1.3‰ at least once . They are responsible for two-thirds of all severe alcohol crashes. If we relate this to the 75 to 140 road deaths in the Netherlands due to alcohol, approximately two thirds, 50 to 95 road deaths per year, are caused by serious alcohol offenders. Traditional measures such as suspension or revocation of the driving licence and imposing fines seem to have hardly any effect on serious alcohol offenders . Goldenbeld, Blom & Houwing  characterize serious alcohol offenders as follows: they are more likely to be male, 30-40 years old, single and to have a low level of education. They have a high degree of alcohol dependence and psychiatric side problems. In addition, they have a mentality that tends to downplay the problem of driving under the influence and to avoid personal responsibility. Also, an antisocial or anti-authoritarian attitude can be part of the mentality. Serious alcohol offenders are also more frequently involved in criminal behaviour in fields other than traffic and they often use drugs in addition to alcohol. Which criminal and administrative measures for driving under the influence are available and how effective are they? Driving under the influence of alcohol is a traffic crime. Drivers who are apprehended for driving under the influence, are often punished with one or more of the following measures: a fine, suspension of the driving licence, an educational measure, or an examination of fitness to drive. A driver who is apprehended for driving under the influence in the Netherlands often faces two procedures, each with its own measures: a criminal procedure in which a penalty is imposed by law (by the Public Prosecution Service (OM) or in Court) and an administrative procedure in which the offender may face a disqualification procedure of CBR, the organisation responsible for driving licences in the Netherlands .The main purpose of the criminal procedure is to punish the offender. The purpose of the disqualification procedure is to determine if a driver is still sufficiently capable or skilled to perform the driving task, and whether he requires a measure to prevent him committing another alcohol offence. The disqualification procedure therefore focuses more on prevention and future behaviour. In the criminal procedure offenders with a blood alcohol content (BAC) up to and including 1.65‰ are punished by the Public Prosecution Service (OM). At a first offense the OM often issues a penalty order (fine), supplemented by suspension of the driving licence. The amount of the fine and the duration of the suspension increase as the BAC category gets higher. At a BAC of 1.66‰ or higher, in an injury crash, or in case of multiple recidivism, the drink-driver is always brought to court. Irrespective of whether the OM or the judge impose a penalty, the drink-driver gets a ‘file’ (formerly a criminal record) in the Judicial Documentation System (JDS). In the administrative procedure the alcohol offender faces the measures that can be issued by CBR: an educational measure (Light Educational Measure Alcohol – LEMA, an Educational Measure Alcohol – EMA), or an examination of fitness to drive, and – until 2015 – the alcohol lock. See also questions How effective are educational measures (EMA and LEMA) in the prevention of driving under the influence? and How effective is an alcohol interlock device in the prevention of driving under the influence?. The outcome of the examination of fitness to drive may be that the driver does not meet the requirements for driving skills or fitness to drive. In that case, the driving licence will be invalidated. The difference with a suspension of the driving licence is that after revocation of the licence the driver must once more prove his skills and/or fitness to drive at CBR. Also in this procedure the height of the BAC, the number of years driving licence possession (novice driver or experienced driver), and multiple offender or not are issues that determine the type of sanction in the administrative procedure. In case of recidivism fines are higher and OBM is longer. According to the Recidivism Scheme Serious Offences of June 2011, the driving licence is invalidated if the BAC in the second alcohol violation > 1.3‰. In this case, the driver must once more take and pass theoretical and practical exam in order to get a driving licence. Table 3. Sanctions for experienced and novice drivers of motor vehicles in the Netherlands. The sanctions are for first offenders; higher penalties apply for multiple offenders (Source: Staatscourant  and Trimbos instituut  ). How effective is an alcohol interlock device in the prevention of driving under the influence? An alcohol interlock programme leads to less recidivism than suspension of the driving licence or revocation of the driving licence. This effect is generally observed only during the period in which the alcohol lock is present. An alcohol lock is an alcohol tester that is connected with the starting mechanism of the car. The tester works as an immobilizer. It is only possible to start the car after having passed an alcohol test. An alcohol interlock device is usually part of an alcolock programme (ASP) that does not only include installing an alcohol interlock device in the car, but also involves an accompanying educational or medical programme. Various international studies in the period 1990-2000 show that the recidivism of users of an alcohol interlock device is 65-90% lower than that of drivers with suspension or revocation of the licence . Based on a meta-analysis of high-quality studies Elder et al. conclude that an alcohol interlock programme reduces the risk of recidivism with 75% during the period that the measure is operational . No evidence was found for an effect of the alcohol interlock device after it has been removed from the vehicle. A review of alcohol interlock programmes published in 2017  discusses four studies     that have been published later than Elder et al. Nieuwkamp et al. conclude that the results of the most recent studies are consistent with the findings of Elder et al. : a considerable reduction in the risk of recidivism, but only during the period in which the alcohol interlock device is installed. The experiences with the Swedish alcohol interlock programme show that the programme results in lasting changes in both alcohol consumption and driving behaviour and that it reduces the number of repeat offenders, even after the programme has been concluded and the alcohol interlock device has been removed  . According to the researchers these lasting changes in Sweden are the result of the integral character of the programme: it addresses the cause of the alcohol problem, and not just the symptoms. Another important part of this integral approach is that frequent medical checks also continue after the removal of the alcohol interlock device . In March 2015, the Dutch Council of State determined that CBR could no longer impose the alcohol interlock programme. The main argument was that imposing the programme under administrative law, without the intervention of a judge, could have disproportionate effects in a substantial number of cases. After consultation of experts the Ministers of the Ministry of Justice and Security and the Ministry of Infrastructure and Water Management concluded that other measures were preferable to reintroduction of the alcohol interlock programme(under criminal law) . The arguments against the alcohol interlock programme were that the target group eligible for the imposition of an alcohol interlock device would be small (30 – 2270 persons in the scenarios that were examined), that the costs of the alcohol interlock device are high and that the alcohol interlock device is susceptible to fraud. The ministers put forward increasing the penalty for driving under the influence of alcohol and lowering the BAC for the study of fitness to drive as alternative measures for the alcohol interlock device. See also the question Which other measures can be taken?. How effective are educational measures (LEMA and EMA) in the prevention of driving under the influence? A study by the Research and Documentation Centre WODC on the effect of the LEMA on recidivism (both general traffic recidivism and drink-driving recidivism were studied) found no demonstrable effect . A WODC-study on the effectiveness of the EMA is expected to be published in 2019. LEMA (Light Educational Measure Alcohol) and EMA (Educational Measure Alcohol) are educational measures that can be imposed by CBR (see also the question Which criminal and administrative measures for driving under the influence are available and how effective are they?). LEMA and EMA are courses about the risks of alcohol use in traffic, and on the necessity of separating alcohol consumption and traffic participation. The LEMA-course takes two afternoons or two mornings with a week in between. The two-day EMA-course is spread over seven weeks. During the course, participants exchange experiences and make assignments at the course location and at home. The course concludes with a personal meeting of one hour with the trainer. How effective is the lower alcohol limit for novice drivers? International research shows that lowering the alcohol limit for novice drivers results in less driving under the influence and in fewer crashes. Dutch data, however, does not show such positive effects. The reduced alcohol limit for novice (usually young) drivers was introduced in the Netherlands in January 2006. The data on alcohol use in traffic by young people in the periods of 4 years before and 4 years after the introduction of the reduced limit (period 2002-2010) indicates that in this period the use of alcohol among young drivers did not decline stronger than that among older drivers . Nor was there a decline in the number of alcohol-related traffic casualties among young people in the first two years after the introduction of the reduced limit . Various reviews of mostly American and Australian research conclude that reducing the alcohol limit for young drivers (mostly to 0 or to 0.2‰) leads to a reduction in driving under the influence and fewer alcohol-related crashes     . A general reduction of the legal limit can have a negative effect on the number of alcohol-related crashes if police-enforcement is not increased simultaneously. This is due to the fact that the actual risk of being apprehended would become smaller for the group of heavy drinkers if the police would, with the same capacity, have to process more offenders . In the Netherlands, the legal alcohol limit for novice drivers was lowered to 0.2‰ in January 2006. The expectation was that the lower limit would lead to a decrease in alcohol consumption by young drivers, but would also contribute to the reduction of the combined use of alcohol and drug. This occurs mainly among young men and goes hand in hand with a very high risk of crashes (see also the question What are the risks of driving under the influence of alcohol?). Data on the alcohol use in weekend nights  shows that in the period 2002-20110 the alcohol use among young drivers did not decline stronger than among older drivers. Weijermars & Van Schagen  also conclude that there is no evidence that the measure had a safety effect in the first years after its introduction. Among 18-24-year-old men the proportion of drivers with a BAC between 0.2 and 0.5‰ in weekend nights declined after introduction of the measure, but the proportion with a BAC ≥ 0.5‰, on the other hand, increased . Among 18-24-year-old women the proportion of drivers with a BAC between 0.2 and 0.5‰ increased slightly, whereas the proportion with a BAC ≥ 0.5‰ remained constant . They also find that the proportion of 18-24-year-olds among the number of fatal and severely injured alcohol-related casualties did not decline since 2006. In 2004/2005, on average 24.6% of the alcohol-related casualties were in the age group 18-24 years old, 2006/2007 the average was 24.8% and the average even reached 28.4% in 2008. If driving under the influence among novice drivers would have developed favourably, the proportion of casualties in the age group 18-24-year-olds would probably have declined, according to Weijermars & Van Schagen . Based on this information it can therefore not be concluded that the measure has had a positive effect on drink-driving by novice drivers. The relatively low probability of being apprehended for novice drivers is possibly the cause of the lack of an effect. How effective is the Bob campaign? The Bob campaign (designated driver campaign) has very likely contributed to a reduction of the alcohol use by both older and young drivers. But as in the same period police enforcement on alcohol use also increased it is not certain to what extent the campaign precisely contributed. In 1995, the Bob-campaign was designed by the Belgian Institute for Road Safety, currently the Vias Institute. The campaign aims to get people to agree on who is the designated driver before drinking alcohol. Late 2001, the Bob-campaign was introduced in the Netherlands. The campaign concept is renewed every so often, to safeguard the appeal of the Bob message for the target group. For example, in 2004 the European Football Championship played an important role in the summer Bob campaign. In 2015, the Bob concept was broadened to all drivers, including solo drivers. In the period 2001-2016, the Bob campaign most probably contributed to the strengthening of the social norm that one should agree on who is the Bob, the designated driver, if you go out and want to drink alcohol, and also to the reduction of alcohol use in traffic by both older and younger drivers. The effect of Bob campaigns, however, goes hand in hand with the intensified enforcement of driving under the influence, which commenced in 2000 as part of the establishment of the special regional traffic enforcement teams. The enforcement of driving under the influence was often aligned with the Bob campaign. The (probable) success of the Bob campaigns can be attributed to three behavioural psychological principles: 1. introduce a social norm and also make it visible; 2. set a good example of conduct; 3. offer a concrete, workable action perspective . How effective are alcohol checks? Regular alcohol checks are effective in reducing the number of alcohol-related crashes. A meta-analysis on results from 40 studies indicates that crashes decline by 17% when alcohol checks are carries out . The effects are considerably larger in Australia (22% reduction) than in the United States (12% reduction). The greater effectiveness in Australia is probably due to the fact that they use random testing on alcohol on large numbers of drivers (around 1 in 3). In random testing every driver is tested for alcohol use, irrespective of gender, age, or colour of the skin. In the United States considerably fewer drivers are tested for alcohol and testing is not random. According to the law, a police officer can only carry out a breath test if a driver is suspected to be under the influence. Partly based on Dutch data, Mathijssen  estimated that each doubling of the number of alcohol checks results in a quarter less alcohol offenders. Which other measures can be taken? Public information, such as the Bob campaign, most probably contributes to reducing driving under the influence (among young people), but the effect cannot be seen in isolation from the intensified police enforcement that is often combined with an information campaign (see also the question How effective is the Bob campaign?). There is no research that shows that public information only or an education programme only, without further measures, such as police enforcement, can reduce driving under the influence. See also SWOV Fact sheets Traffic education and Public service advertising . However, there is evidence, mostly based on studies from the United States, that longer-running education programmes in schools and universities about the (multiple) risks of alcohol (and other substances) can reduce alcohol consumption among young people   . These universal prevention programmes are broader than just the prevention of driving under the influence. It is likely that in the United States with large distances and high car dependence, a reduction in problematic alcohol use results in a reduction in driving under the influence. In the Netherlands, with a general alcohol limit of 0.5‰ and a limit of 0.2‰ for novice drivers, further lowering of the limit probably will have no positive road safety effect Mathijssen  has estimated that introduction of the 0-limit in the Netherlands would even have an adverse road safety effect. An important reason is that further lowering would require too much enforcement capacity for minor alcohol offences at the expense of serious alcohol violations. Furthermore, according to Mathijssen decreasing the general limit from 0.5‰ to 0.2‰ will have an unfavourable rather than a favourable effect on road safety. The earlier reduction of the limit for young or novice drivers to 0.2‰ showed no improvement in driving under the influence or alcohol-related traffic crashes among young people in the Netherlands (see also the question How effective is the lower alcohol limit for novice drivers?). In countries where alcohol limits are higher than in the Netherlands (e.g. Great Britain and the United States) lowering the limit could contribute to road safety. In international reviews of research on reduction of the limit Macaluso et al. and Fell & Scherer  conclude that in most countries lowering the limit results in a reduction in crashes for both older and younger drivers. In these international studies the limit reduction often is from 0.5 to 0.8‰, from 0.10 to 0.8‰, or from 0.8 to 0.2‰. found no relation between self-reported driving under the influence and perceived risks of being fined, licence suspension, or of an ankle bracelet that monitors alcohol use (SCRAMM). Suspension or revocation of the driving licence is no guarantee that these drivers do in fact no longer drive a car. Based on telephone interviews with 1000 drivers in Austria, for example, it was estimated that more than a quarter of the drivers whose driving licence had been suspended in 2012 continued to drive, and about 15% even continued to drive under the influence of alcohol . American and Australian studies (discussed in Vis, Goldenbeld & Van Bruggen ) indicate that 50-70% of the alcohol offenders continued to drive (occasionally), also after suspension or revocation of the licence. Goldenbeld, Houwing & Blom  conclude that traditional measures, such as fines and driving disqualifications, seem to have little or no effect on the group of serious alcohol offenders. At least 45% of the serious alcohol offenders are persistent in their violation behaviour and continue even after having been apprehended by the police for driving under the influence. Better profiling of alcohol offenders can be helpful in developing better prevention measures or providing a better referral to criminal and administrative measures (or forms of assistance). New preventive measures should be developed for target groups of serious (alcohol) offenders which are already known not to be helped effectively by current policy. Prevention should have a broader approach than addressing serious or recurrent offenders in traffic. Not just current alcohol offenders, but also potential or future offenders need to be addressed by the policy and stimulated to change their behaviour. An example of a possible new, preventive measure is regular or continuous monitoring of alcohol consumption by alcohol offenders. In America and also in the Netherlands tests are being done with an ankle bracelet that can register a person's alcohol consumption through perspiration  . In the US, alcohol offenders whose alcohol consumption is measured through such an ankle bracelet, were found to hardly reoffend when they wearing the ankle bracelet. Offenders who did reoffend were found to do so at a later time did than the offenders in a control group .
. I&O Research (2018). Rijden onder invloed in Nederland in 2002-2017: ontwikkeling van het alcoholgebruik van automobilisten in weekendnachten. Ministerie van Infrastructuur en Waterstaat, Water, Verkeer en Leefomgeving WVL, ‘s-Gravenhage.
. Minister van VenJ (2017). Antwoorden op Kamervragen over het aantal alcoholcontroles in het verkeer. Brief aan Tweede kamer. Ministerie van Justitie en Veiligheid, Den Haag.
. ETSC (2017). Blood Alcohol Content (BAC) drink driving limits across Europe. ETSC European Transport Safety Council. Retrieved 14 May 2018 from https://etsc.eu/blood-alcohol-content-bac-drink-driving-limits-across-europe/.
. Moskowitz, H. & Florentino, D. (2000). A review of the literature on the effects of low doses of alcohol on driving-related skills. Department of Transportation DOT, National Highway Traffic Safety Administration NHTSA, Washington, D.C.
. Caird, J., Lees, M. & Edwards, C. (2005). The naturalistic driver model: A review of distraction, impairment and emergency factors. University of California, Institute of Transportation Studies ITS, Berkeley, CA.
. Dupont, E., Martensen, H. & Silverans, P. (2010). Verlaagde alcohollimiet voor onervaren bestuurders en voor bestuurders van grote voertuigen: 0,2. Belgisch Instituut voor de Verkeersveiligheid BIVV, Observatorium voor de Verkeersveiligheid, Brussel.
. Irwin, C., Iudakhina, E., Desbrow, B. & McCartney, D. (2017). Effects of acute alcohol consumption on measures of simulated driving: A systematic review and meta-analysis. In: Accident Analysis & Prevention, vol. 102, p. 248-266.
. Houwing, S., Bijleveld, F.D., Commandeur, J.J.F. & Vissers, L. (2014). Het werkelijk aandeel verkeersdoden als gevolg van alcohol: aanpassing schattingsmethodiek. R-2014-32. SWOV, Den Haag.
. Blomberg, R.D., Peck, R.C., Moskowitz, H., Burns, M., et al. (2005). Crash risk of alcohol involved driving: A case-control study. Contract Number DTNH22-94-C-05001 Dunlap and Associates, Inc., Stamford, CT.
. Olkkonen, S. & Honkanen, R. (1990). The role of alcohol in nonfatal bicycle injuries. In: Accident Analysis & Prevention, vol. 22, nr. 1, p. 89-96.
. Asbridge, M., Mann, R., Cusimano, M.D., Tallon, J.M., et al. (2014). Cycling-related crash risk and the role of cannabis and alcohol: a case-crossover study. In: Preventive Medicine, vol. 66, p. 80-86.
. Martínez-Ruiz, V., Lardelli-Claret, P., Jiménez-Mejías, E., Amezcua-Prieto, C., et al. (2013). Risk factors for causing road crashes involving cyclists: An application of a quasi-induced exposure method. In: Accident Analysis & Prevention, vol. 51, p. 228-237.
. Hels, T., Bernhoft, I.M., Lyckegaard, A., Houwing, S., et al. (2011). Risk of injury by driving with alcohol and other drugs. Deliverable D2.3.5 of the EU FP6 project DRUID. European Commission, Brussels.
. Isalberti, C., Van der Linden, T., Legrand, S.-A., Verstraete, A., et al. (2011). Prevalence of alcohol and other psychoactive substances in injured and killed drivers. Deliverable D2.2.5 of the EU FP6 project DRUID. European Commission, Brussels.
. Mathijssen, R. & Houwing, S. (2005). The prevalence and relative risk of drink and drug driving in the Netherlands: a case-control study in the Tilburg police district; research in the framework of the European research programme IMMORTAL R-2005-9. SWOV, Leidschendam.
. Keall, M.D., Frith, W.J. & Patterson, T.L. (2004). The influence of alcohol, age and number of passengers on the night-time risk of driver fatal injury in New Zealand. In: Accident Analysis & Prevention, vol. 36, nr. 1, p. 49-61.
. Peck, R.C., Gebers, M.A., Voas, R.B. & Romano, E. (2008). The relationship between blood alcohol concentration (BAC), age, and crash risk. In: Journal of Safety Research, vol. 39, nr. 3, p. 311-319.
. Goldenbeld, C., Blom, M. & Houwing, S. (2016). Zware alcoholovertreders in het verkeer. Omvang van het probleem en kenmerken van de overtreders. R-2016-12. SWOV, Den Haag.
. Staatscourant (2017). Richtlijn voor strafvordering rijden onder invloed van alcohol en/of drugs en rijden tijdens een rijverbod. Staatscourant nr. 52658, 27 september 2017.
. Trimbos Instituut (2018). Straffen rijden onder invloed. Retrieved 16 May 2018 from https://www.alcoholinfo.nl/publiek/verkeer/straffen-rijden-onder-invloed.
. Bax, C., Kärki, O., Evers, C., Bernhoft, I.M., et al. (2001). Alcohol interlock implementation in the European Union; Feasibility study. Final report of the European research project. D-2001-20. SWOV, Leidschendam.
. Elder, R.W., Voas, R., Beirness, D., Shults, R.A., et al. (2011). Effectiveness of Ignition Interlocks for Preventing Alcohol-Impaired Driving and Alcohol-Related Crashes: A Community Guide Systematic Review. In: American Journal of Preventive Medicine, vol. 40, nr. 3, p. 362-376.
. Nieuwkamp, R., Martensen, H. & Meesmann, U. (2017). Alcohol interlock. European Road Safety Decision Support System, developed by the H2020 project SafetyCube. Retrieved March 1 2018 from www.roadsafety-dss.eu.
. Assailly, J.P. & Cestac, J. (2014). Alcohol interlocks and prevention of drunk-driving recidivism. In: Revue Européenne de Psychologie Appliquée/European Review of Applied Psychology, vol. 64, nr. 3, p. 141-149.
. Ma, T., Byrne, P.A., Bhatti, J.A. & Elzohairy, Y. (2016). Program design for incentivizing ignition interlock installation for alcohol-impaired drivers: The Ontario approach. In: Accident Analysis & Prevention, vol. 95, p. 27-32.
. Voas, R.B., Tippetts, A.S., Bergen, G., Grosz, M., et al. (2016). Mandating Treatment Based on Interlock Performance: Evidence for Effectiveness. In: Alcoholism: Clinical and Experimental Research, vol. 40, nr. 9, p. 1953-1960.
. Voas, R.B., Tippetts, A.S. & Grosz, M. (2013). Administrative Reinstatement Interlock Programs: Florida, A 10‐Year Study. In: Alcoholism: Clinical and Experimental Research, vol. 37, nr. 7, p. 1243-1251.
. Bjerre, B. & Thorsson, U. (2008). Is an alcohol ignition interlock programme a useful tool for changing the alcohol and driving habits of drink-drivers? In: Accident Analysis & Prevention, vol. 40, nr. 1, p. 267-273.
. Gustafsson, S. & Forsman, A. (2016). Utvärdering av alkolås efter rattfylleri: enkätstudie [Evaluation of a Swedish alcohol interlock program for drink driving offenders: questionnaire study]. VTI-code: 35-2016; summary in English. VTI, Linköping.
. Minister van JenV (2018). Aanpak rijden onder invloed van alcohol. 29398-588. Brief regering dd. 7 maart 2018.
. Blom, M., Blokdijk, D. & Weijters, G. (2017). Recidive na een educatieve maatregel voor verkeersovertreders of tijdens een Alcoholslotprogramma. Cahier 2017-15. Wetenschappelijk Onderzoek- en Documentatiecentrum WODC, Den Haag.
. Zwerling, C. & Jones, M.P. (1999). Evaluation of the effectiveness of low blood alcohol concentration laws for younger drivers. In: American Journal of Preventive Medicine, vol. 16, nr. 1, Supplement 1, p. 76-80.
. Shults, R.A., Elder, R.W., Sleet, D.A., Nichols, J.L., et al. (2001). Reviews of evidence regarding interventions to reduce alcohol-impaired driving. In: American Journal of Preventive Medicine, vol. 21, nr. 4, Supplement 1, p. 66-88.
. Romano, E., Scherer, M., Fell, J. & Taylor, E. (2015). A comprehensive examination of U.S. laws enacted to reduce alcohol-related crashes among underage drivers. In: Journal of Safety Research, vol. 55, p. 213-221.
. Macaluso, G., Theofilatos, A., Botteghi, G. & Ziakopoulos, A. (2017). Lowering BAC limits & BAC limits for specific groups (novice). European Road Safety Decision Support System, developed by the H2020 project SafetyCube. Retrieved March 1 2018 from www.roadsafety-dss.eu.
. Pentillä, A., Portman, M., Kuoppasalmi, K., Lunetta, P., et al. (2004). Roadside surveys in Uusimaa in Finland. Increase of the rate of motor vehicle drivers in traffic with a low blood alcohol content. In: Alcohol, drugs and traffic safety, proceedings of the 17th ICADTS International Conference on Alcohol, Drugs and Traffic Safety. 8-13 August 2004, Glasgow, United Kingdom.
. DVS (2008). Rijden onder invloed in Nederland in 1999-2007: ontwikkeling van het alcoholgebruik van automobilisten in weekendnachten. Directoraat-Generaal Rijkswaterstaat, Dienst Verkeer en Scheepvaart DVS, Delft.
. Alcocer, S. (2016). Effectiviteit van de gedragsverandering mechanismen binnen de Bob campagne. Hogeschool Utrecht, Utrecht.
. Erke, A., Goldenbeld, C. & Vaa, T. (2009). The effects of drink-driving checkpoints on crashes—A meta-analysis. In: Accident Analysis & Prevention, vol. 41, nr. 5, p. 914-923.
. Foxcroft, D.R. & Tsertsvadze, A. (2011). Universal school-based prevention programs for alcohol misuse in young people. In: The Cochrane database of systematic reviews.
. Doncker, J. de, Donder, E. de & Möbius, D. (2015). Dossier alcohol. VAD, Vlaams expertisecentrum Alcohol en andere Drugs, Brussel.
. Scott-Sheldon, L.A., Carey, K.B., Elliott, J.C., Garey, L., et al. (2014). Efficacy of alcohol interventions for first-year college students: a meta-analytic review of randomized controlled trials. In: Journal of consulting and clinical psychology, vol. 82, nr. 2, p. 177-188.
. Mathijssen, M.P.M. (1999). Schatting van de effecten van verlaging van de wettelijke limiet voor alcoholgebruik in het verkeer. R-99-11. SWOV, Leidschendam.
. Fell, J.C. & Scherer, M. (2017). Estimation of the potential effectiveness of lowering the Blood Alcohol Concentration (BAC) limit for driving from 0.08 to 0.05 grams per deciliter in the United States. In: Alcoholism: Clinical and Experimental Research, vol. 41, nr. 12, p. 2128-2139.
. Briscoe, S. (2004). Raising the bar: can increased statutory penalties deter drink-drivers? In: Accident Analysis & Prevention, vol. 36, nr. 5, p. 919-929.
. Mathijssen, M.P.M. (1994). Rijden onder invloed in Nederland, 1992-1993; Ontwikkeling van het alcoholgebruik van automobilisten in weekendnachten. R-94-21. SWOV, Leidschendam.
. Wagenaar, A.C., Maldonado-Molina, M.M., Erickson, D.J., Ma, L., et al. (2007). General deterrence effects of U.S. statutory DUI fine and jail penalties: Long-term follow-up in 32 states. In: Accident Analysis & Prevention, vol. 39, nr. 5, p. 982-994.
. Moffatt, S. & Poynton, S. (2007). The deterrent effect of higher fines on recidivism: Driving offences. In: Crime and Justice Bulletin 2007, vol. 106.
. Sloan, F.A., McCutchan, S.A. & Eldred, L.M. (2017). Alcohol-impaired driving and perceived risks of legal consequences. In: Alcoholism: Clinical and Experimental Research, vol. 41, nr. 2, p. 432-442.
. Raml, R. (2017). Ein innovativer zugang in der marktforschung: die beleuchtung des dunkelfelds. Fachtagung Verkehr & Mobilität, 12.01.2017. KvF, IFES, Wenen.
. Vis, M.A., Goldenbeld, C. & van Bruggen, B. (2010). Rijden zonder geldig rijbewijs in Nederland. Hoe vaak komt het voor en wat betekent het voor de verkeersveiligheid? R-2010-13. SWOV, Leidschendam.
. Kilmer, B., Nicosia, N., Heaton, P. & Midgette, G. (2013). Efficacy of Frequent Monitoring With Swift, Certain, and Modest Sanctions for Violations: Insights From South Dakota’s 24/7 Sobriety Project. In: American Journal of Public Health, vol. 103, nr. 1, p. e37-e43.
. Tison, J., Nichols, J.L., Casanova, T. & Chaudhary, N.K. (2015). Comparative study and evaluation of SCRAM use, recidivism rates, and characteristics. DOT HS 812 143. Department of Transportation DOT, National Highway Traffic Safety Administration NHTSA, Washington, D.C.
SWOV (2018). Driving under the influence of alcohol. SWOV Fact sheet, June 2018, SWOV, The Hague.